If you agree then Click on the ShareAction links below to contact your own funds. It takes two minutes and all you need is the name of the scheme and not policy numbers. Another incoming CEO, another unreasonable pay packet. 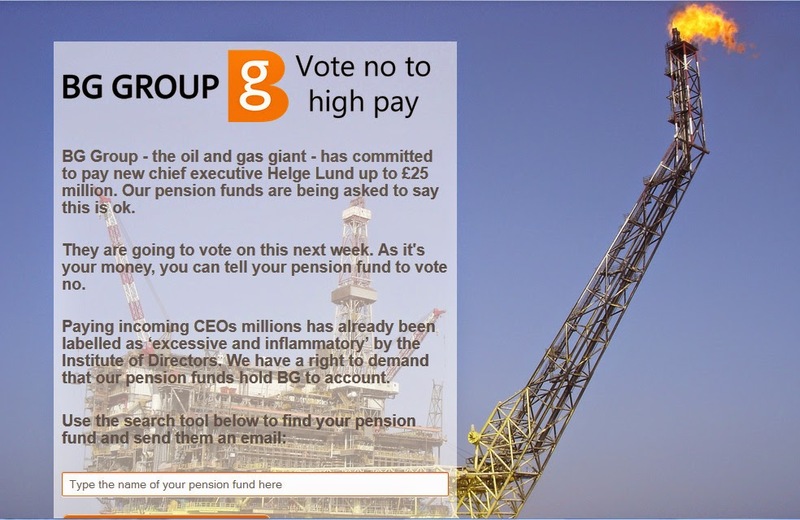 This week there’s a revolt brewing over oil and gas giant BG Group, who are looking to pay incoming CEO Helge Lund up to £25 million. Not only is this seen as high in the industry, it is in violation of the pay policy approved by BG shareholders only six months ago at their AGM. Shareholders are being asked to approve Lund's pay packet at an extraordinary meeting next week. Our savings give us a say at that meeting: our pension funds are BG Group shareholders, and they can vote no to this excessive pay deal. Will you tell your pension fund to vote against Lund's pay packet? Click here to email your fund. Investment managers and Business Secretary Vince Cable have already come out and criticised this pay packet, while industry experts have labelled it "excessive and inflammatory." Over the past few years, more and more shareholders have been taking a stand against high pay – and supporting calls for companies to pay fair wages instead. At a time of austerity, when millions are struggling financially, greed at the top through high pay destroys trust and contributes to growing levels of inequality. We have the opportunity, as pension savers, to counterbalance this and use our savings as a force for good in the investment system. So let’s group together and put that to the test. Our pension funds are big shareholders in BG Group – if enough of them vote no, then it would be enough to reject the pay packet at BG’s meeting next week. Can you send your pension fund a quick email to make sure they vote no? We’ve got a template email you can get started with. Let’s make sure that BG, one of the largest oil and gas companies in the world, know that excessive high pay won’t fly with us or its shareholders. Joe Murphy, "Vince Cable urges shareholders to reject £12m bonus deal for energy chief," Evening Standard (26 November 2014). Just a general question, rather than one linked to this post - do you know what has happened to the tigmoo website - it doesn't appear to exist anymore? no I don't Ian but I had the same thought myself a little while ago (and did nothing) but will contact John Woods from TUC to see whats up with tigmoo.